Mayonnaise is a staple ingredient in so many different sauces and recipes, but unfortunately vegan mayo options are rather limited. Instead of buying expensive egg free mayo, I prefer to make my own. This creamy egg free cashew mayo is super simple and done in just 3 easy steps, but most importantly, it’s delicious! Once you try it you’ll never want store-bought mayo again. This mayo gets its creaminess from you guessed it – cashews. In order to soften them for blending I let my cashews soak for 2-4 hours. Depending on the strength of your blender you may need to let them soak overnight. Once your cashews have soaked for a few hours, drain them and throw them in the blender along with the remaining ingredients. I use 1/4 cup of almond milk but again this will depend on your blender. You may need to add more liquid to get the blending process started. Blend on high 30-60 seconds or as needed until the mayonnaise is smooth and creamy. Cashew mayo is the perfect “healthy”(er) substitute for any recipe that calls for mayonnaise – and it’s vegan! You can use it for everything from vegan ranch dressing, to a creamy potato salad or vegan coleslaw. The possibilities are endless! 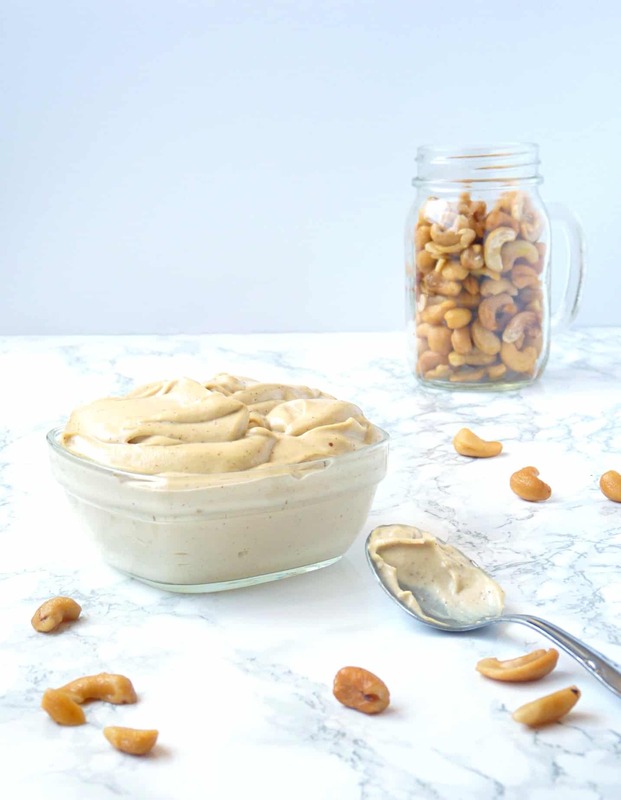 A smooth, creamy, and delicious vegan mayonnaise made with cashews! There’s no need for expensive store-bought mayo when you can make your own in just 3 easy steps! This is the perfect mayo base to add in other fun ingredients for a more flavorful mayo. Some of my favorites are Sriracha mayo, avocado mayo, and chipotle mayo! Thanks for the recipe! I want to try the Sriracha mayo. That sounds yummy!